The faux president’s comeback seems to have attracted mixed reaction among television viewers, many of whom took his words on "buddy" Brett Kavanaugh and Trump’s presidential term perhaps too closely to heart. 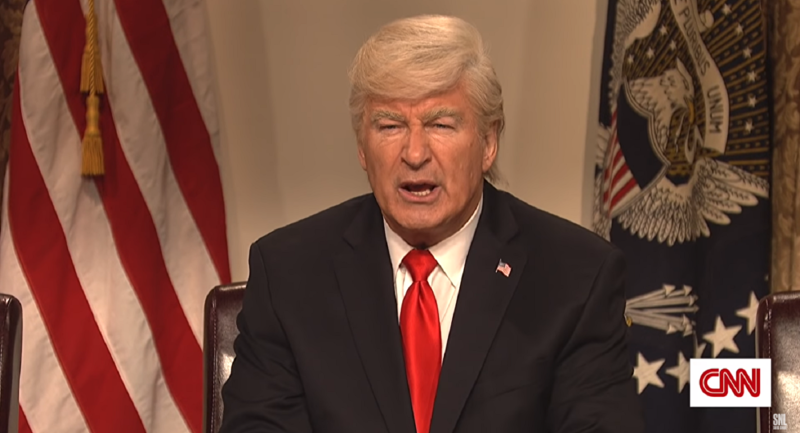 Noted US actor Alec Baldwin’s notorious imitation of US President Donald Trump is back on NBC’s “Saturday Night Live ” after a few weeks away, this time to mock the latter's call to declare a national emergency in a bid to ultimately earmark around $8 billion in necessary funds to build a protective wall on the Mexican border. "I'm here to declare a very urgent, important national emergency," Baldwin, speaking in character as the US president said. "This is a big one, so I don't want to waste any time, but first I'd like to blow my own horn." After unexpectedly sharing his measurements and health examination results, noting — satirically — also that he is 6 feet, 7 inches tall, weighs 185 pounds and is "shredded," Baldwin went on to explain why his Trump character is in desperate need of the border wall. Dwelling on positive aspects for a border wall, Baldwin-as-Trump suggested that it makes one feel safe, and stated that “you don’t have to be smart to understand that; in fact, it’s even easier if you are not”. The in-character actor then asserted that chances are that the declaration of an national emergency would lead to a challenge in court, before bringing up, tongue-in-cheek, the much-covered Brett Kavanaugh case. "I'm going to sign these papers for the emergency then I'll immediately be sued, then the court won't rule in my favor, then it'll go to the Supreme Court, then I'll call my buddy [Brett] Kavanaugh, then I'll say it's time to repay the Donny, then he'll say 'new phone, who this?'" The last quip in reference to newly-elected Democratic Representative Alexandria Ocasio-Cortez's now-famous comeback to older US politicians suggesting that she keep a lower profile. The overall process of declaring a national emergency, Baldwin’s Trump remarked, would ultimately end his “personal hell” of leading the country. "In conclusion, this is a total emergency, a five-alarm blaze, which means I have to go to Mar-a-Lago and play some golf," the actor remarked. “Alec Baldwin for the win,” commented one of the actor’s huge army of fans on Twitter. — Sharon Jaffe-Johnson (@jaffe_johnson) 17 февраля 2019 г. — Kat Hamilton (@katwoman_81) 17 февраля 2019 г.
Oh my god. It was so good! — Mark Anderson (@markemer) 17 февраля 2019 г. — JR (@jreed00) 17 февраля 2019 г. And also *kudos* to the SNL writing staff. — Carol Kerrigan 🇺🇸116th🇺🇸 (@SeaKerr18) 17 февраля 2019 г. This will stop being funny when Trump starts throwing people in prison for criticizing him. And that's exactly what he wants to do. It CAN happen here. — News Corpse (@NewsCorpse) 17 февраля 2019 г. Our personal hell of The Con playing president will be over! — uOMi (@suenosdeuomi) 17 февраля 2019 г. Low energy performance. It's as though Alec Baldwin's had enough of reprising this role. It appears as though he's had a change of heart regarding the president. — MonkeyMan (@MeHonkeyMonkey) 17 февраля 2019 г.